Our New Pet Bathing Massaging Tool-Give your Pets a Happy and Healthy Life! Upgrade Version-Water Shower Sprayer and Grooming Brush Glove 2 in 1, very handy to groom and brush your pets! The wearable pet grooming glove make it easy to bathe your pet, one hand to bursh and another hand to control them. The adjustable strap gives comfortable fit for you hand with all shapes and all sizes. 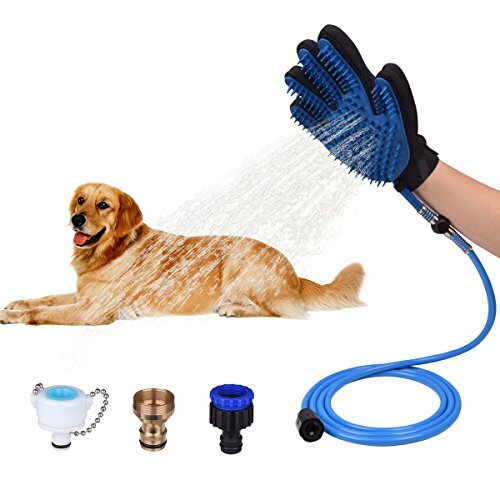 Water Sprayer and Bathing Brush Glove in hand, enable you soak, scrub, and rinse your pet by injecting water deep into their fur. 2.Choose the right faucet adapter. The wider end will be connected to your water faucet and the narrow end has to be connected with the interface of the product. 3.Turn on your water faucet, then put on the glove and open its water switch. Water will splash out from glove. 4.Move the glove gently back and forward to massage your pet. Warranty-we provide 12 months free warranty service, so you can enjoy your purchase with confidence. Click "ADD to Cart" to get good bathing tool for your pets now! Do Not Hesitate! You deserve the best! Pet Shower Sprayer--- five finger design helps control your pets easily when cleaning. Sprayer hole with 10mm water impact can get to the densest pets fur for deep cleaning. Reduce spraying water, speed up bath time and relieve stress for anxious pets. Three Faucet Adapters-this pet bathing glove with three adapters fits to multiple different interfaces, easy to install and remove. The adapter is fit for shower bath tub and outdoor garden hose. If you have any questions about this product by Witskey, contact us by completing and submitting the form below. If you are looking for a specif part number, please include it with your message.